In the two years since starting Theme of the Crop, I’ve gotten to know a bunch of you as customers. You’re rushing to get a site up on deadline. Or you’re working through your first WordPress site while running your own restaurant. And you’re always trying to get noticed in a sea of competitors. One of my goals for Theme of the Crop’s third year is to better guide you through the WordPress ecosystem. To do this, I’m going to introduce you to value-added services and, where possible, partner with third-party providers who can help you manage your website better and grow your business. In this post, I’m going to talk with Ryan Sullivan of WP Site Care. 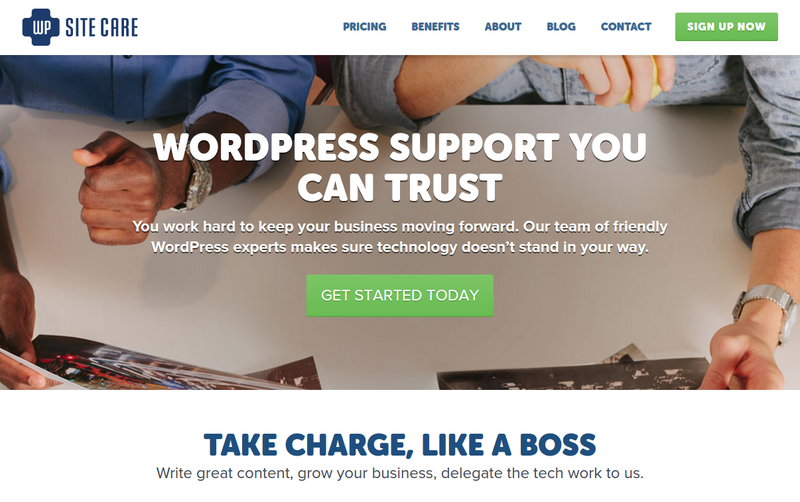 He calls himself a personal WordPress concierge, offering top-notch support and site management features. And he charges a premium for the service. Is it worth it? I put the question to him. Why should a restaurant website pay $79/mo for WP Site Care? The best reason I can think of is the same reason I should be paying to eat at a great restaurant. Restaurant owners are pros at creating a great experience, managing logistics of food delivery and guest accommodations, and preparing delicious food. None of those are things that I can provide. I don’t have the expertise to handle something like that. We act as your website manager. We make sure things are always running smoothly, without our clients needing to become experts in WordPress and all of its moving parts. If us managing our customer’s restaurant website creates enough extra time for them to get one more customer through the front door, we’ve likely delivered on our value. Local Google searches are often a primary source of web traffic for restaurants. Can WP Site Care help restaurant websites get noticed? We definitely can. We use a variety of methods to help create local awareness for restaurants in search engines, strictly on the technical side. We don’t do much in terms of marketing, but we make sure your site is technically sound for local search. One of our favorite local SEO WordPress plugins is Business Profile (made by Theme of the Crop) that we’ve mentioned before in our best WordPress plugins article. Your website talks about improving performance. This is important in the restaurant industry, where there are a lot of competitors and customers will often go with the first place they like. Can you tell me some of the problems you frequently see with the websites you manage and how WP Site Care addresses these? When it comes to performance we evaluate a lot of different things, but some of the most common performance issues are either related to bloated themes or bloated plugins. We don’t blame users. A lot of people just want to add a bit of functionality to a website so they search for a plugin to handle it, and install it without knowing whether or not it’s well-built. That’s one of the reasons I love the approach of Theme of the Crop themes. They’re lightweight and logically separate the look of the site from the function of it. Unfortunately that’s pretty rare. The Swiss Army Knife theme (one theme to do it all) is something we see over and over again, and unfortunately can have a seriously negative impact on performance. I was impressed with your new Walkie Talkie service. It showed that you were really committed to supporting your customers. Do you have any success stories you can share where you sorted out problems with customer websites on short notice? Thanks! We’ve been really happy with the Walkie Talkie roll out, and are especially pleased with how well that launch has gone. We’ve had very few bugs reported with the communication system, which is pretty remarkable considering the massive diversity in environments for our customers. My favorite success story to date was a customer who had email routing issues because of an error she made editing her domain name records. With our legacy systems that used email-only, she would have had to visit our site and contact us through our form. But because Walkie Talkie talks directly with the Help Scout API, she was able to reach out to us via Walkie Talkie and we fixed her DNS issue while she continued to get her work done in the WordPress dashboard. It was a little thing but I know that customer was super happy she didn’t have to break up her workflow, and was still able to get in touch with us even though her email was out of commission. If you could convince restaurant websites to do one thing — other than sign up for WP Site Care — what would it be? Mobile, mobile, mobile! This is a personal pet peeve of mine, but generally speaking when I’m looking for a place to eat, I’m traveling or I’m on the road. I’ll click through to a restaurant website via Yelp or Google, and I’ll either be prompted to download a pdf for the menu, or I’ll have to pinch and zoom which is a terrible experience. The value of a mobile-friendly website for restaurants can’t be overstated. I know that $79/mo will seem like a steep price for a lot of people. But for restaurants, it only takes a few extra customers a month to earn that investment back. That’s why I strongly recommend WP Site Care. While many managed site providers give you technical support, they won’t focus on your overall business needs. WP Site Care focuses on exactly the kind of areas where restaurant websites need to excel. Thanks to Ryan for answering my questions. You can reach out to him at WP Site Care or find him on Twitter.